Take a bowl add yoghurt, chopped green chillies, turmeric powder & salt to mix well. Take a big bowl add rawa , 2 tbsp oil to mix well & add yoghurt mixture. Add all vegetables & Mix well. Add with water & make a mild thick batter. Add in the ENO salt & Mix well which helps in raising the batter when it is rested. 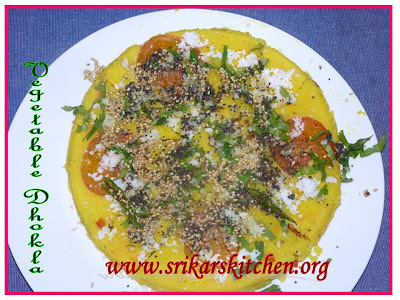 Grease oil in a dhokla plate, arrange the tomato & add the dhokla mix. Pressure cooked (with out using whistle) like idly, around 6- 7 mins. Cut in to equal potions. Heat oil in a pan Temper with mustard seed, sesame seed, deseeded sliced green chillies, grated coconut,cilantro & top it up on the Dhokla. 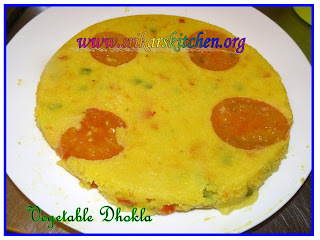 Check here for the ordinary Dhokla recipe. very nice.. healthy and colorful..
Veggie dhokla looks very colourful..
Hey,Thank you for stopping by my blog and for the lovely comment. You have a very colorful blog. Veg Dhokla looks yummy.Will keep visiting. looks so good! Lovely color. Yummy! I too want to try this out for a long time,thanks for posting Sri! Perfect and Nice.. Looks inviting! Do send something for my RD event! Thank you for stopping by Sri...You have a wonderful space here...Vegetable dhokla looks perfect and innovative...Good job. 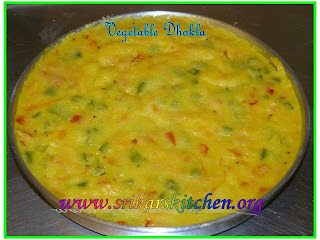 i love to try dhokla. Never tried before. Looks perfect.